The Iraqi army says it has taken a number of villages on the outskirts of Tal Afar as part of a major offensive against so-called Islamic State (IS). It comes as the UN warns thousands fleeing the northern city are at risk, trekking for hours in extreme heat. Separately, Iraqi forces are being urged to rescue people from the minority Yazidi community who the militants may be holding as slaves. Tal Afar is one of the last urban strongholds held by IS in the country. The city, which had a predominantly ethnic Turkmen population of 200,000 before it fell to IS in 2014, has strategic significance as it sits on what was once a major jihadist supply route between the militants' former stronghold, Mosul, and the Syrian border. Lt Gen Abdul Amir Rashid Yarallah, who is leading the Tal Afar operation, said the army had "liberated" five villages to the east of the city, while counter-terrorism forces advanced through two villages in the south west. 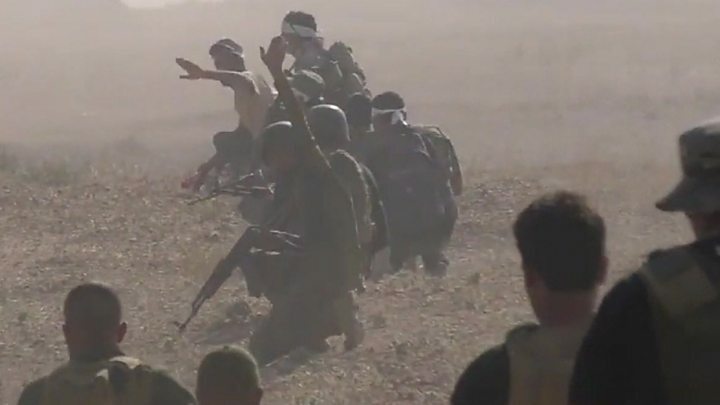 Shia militiamen from the paramilitary Popular Mobilisation (Hashd al-Shaabi, or PM) force helped to regain control of another village in the east, as well as areas to the south and north west. Iraqi Federal Police commander Lt Gen Raed Jawdat said his forces, backed by PM fighters, had already taken another two villages and killed 20 IS militants. The PM, which did not play a big part in retaking the mainly Sunni city of Mosul, has taken a far more active role in Tal Afar, which had a sizeable Shia population before 2014. Government forces on the ground, as well as Kurdish Peshmerga to the north, are being aided by US-led coalition air strikes. Meanwhile, IS said via its Amaq news agency that it had killed 114 Iraqi troops and destroyed 40 vehicles on the first day of fighting. The UN's humanitarian co-ordinator for Iraq, Lise Grande, warned on Sunday that thousands of civilians fleeing for safety faced extreme conditions, with reports of tough conditions inside the city. "Families are trekking for 10 to 20 hours in extreme heat to reach mustering points. They are arriving exhausted and dehydrated." Ms Grande said more than 30,000 people had already fled, and the UN was preparing for the arrival of thousands more in the coming days and weeks. Anti-IS coalition forces estimate that between 50,000 and 100,000 civilians remain in and around the city. Separately, a Yazidi MP has urged the quick rescue of members of her community who may still be trapped by IS in the city. In a statement reported by Reuters, Vian Dakhil said she was particularly concerned about the fate of children who had been kidnapped, sold or had their identities changed. The UN said recently that IS is holding about 3,000 Yazidi women and girls in conditions of sexual slavery. Announcing the new military offensive on Sunday, Prime Minister Haider al-Abadi said the jihadists had the choice between "surrender or die". A senior Iraqi commander, who was once mayor of Tal Afar, estimates there to be between 1,500 and 2,000 militants and their family members left in the city. Beside Tal Afar, IS controls territory around Hawija, 170km (105 miles) to the south-east; and from Ana to Al-Qaim in the Euphrates river valley, 220km to the south.